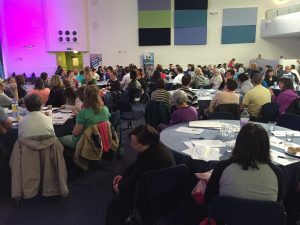 Home » News » Hampshire Self Advocacy Day a great success! Hampshire Self Advocacy Day a great success! Speakeasy supported 20 people to take part in an event for 100 people with a learning disability from all over Hampshire on 19th May. People had the chance to take part in a workshop in the morning, have lunch and talk to the police and other exhibitors over lunch, then feed back their views in the afternoon. The Hampshire County Council Director of Adult Services Graham Allen listened to what people said, and will respond to the report in the next few months. See photos of the day here and the full report here.